Owned by Mowasat Healthcare Company (MHC), a healthcare arm of Nafais Holding Company- New Mowasat Hospital was established in 1965 and following “Caring for generations”. This hospital is considered as one of the best in the region with luxury premises, facilities and great management. 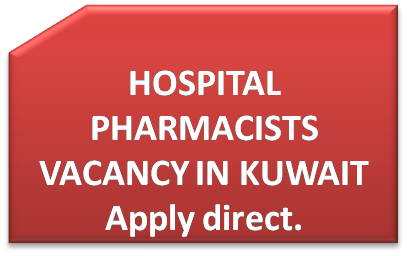 We have noticed that there is a vacancy for Pharmacists in this amazing organization with a job summary as "The Pharmacist- Pharmacy provides prescribed medications, drugs and other pharmaceuticals as needed for adequate patient care according to professional standards and practices. Ensures that patient’s pharmaceutical needs are effectively met in accordance with Ministry of Health regulations and Pharmacy Policy & Guidelines"
How to apply for the Post of Pharmacist in Kuwait.